Bina and Austin have been best friends since birth. 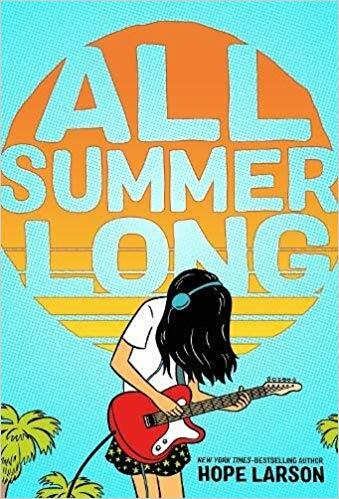 Fast forward thirteen years to the summer before eighth grade, and something is up… Austin suddenly seems too old for the fun traditions he and Bina have kept up over the years, and Bina is starting to wonder if he even wants to be her friend anymore. This dynamic graphic novel catalogs Bina’s summer, including her developing relationships with friends, family, and music. A refreshing perspective on a young girl growing up, this book is peppered with intriguing and nontraditional characters including Bina’s gay older brother who is adopting a child with his husband, her multiracial parents, and Austin’s tattooed single mom. Clever Bina is an endearing character, being largely unaware of social expectations for a teen and oblivious to others’ perceptions of her. At once relatable and inspirational, she’s an alluring perspective to follow throughout. A couple of very mild innuendos concerning older characters prompt this book toward a teen audience; however, being so benign, a younger reader would not be likely to catch on and therefore the text is likely to have appeal for the middle school audience.